FACTORING POLICY. 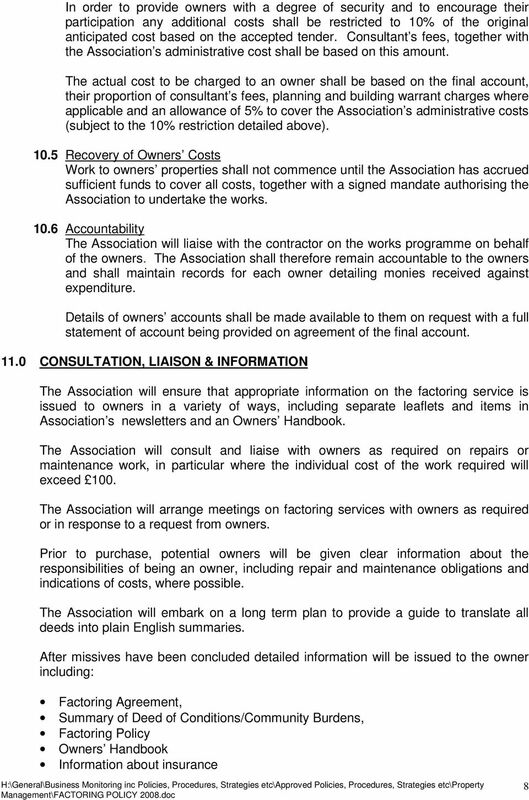 This policy sets out the scope of and management arrangements for the Association s Factoring Service. Download "FACTORING POLICY. 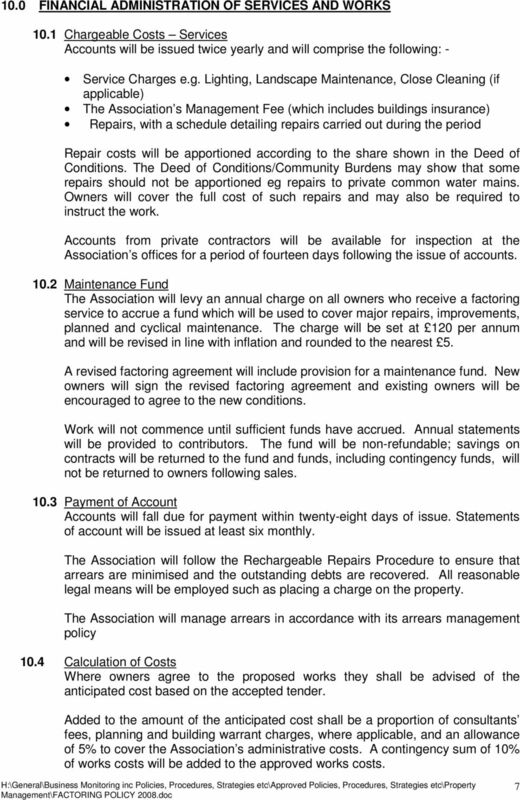 This policy sets out the scope of and management arrangements for the Association s Factoring Service." 1 FACTORING POLICY 1.0 INTRODUCTION This policy sets out the scope of and management arrangements for the Association s Factoring Service. 2.0 FACTORING DEFINITION a property management service provided to property owners to co-ordinate and carry out work on their behalf, usually in respect of repairs, improvements, maintenance, insurance and associated administration. 3.0 REGULATORY AND LEGISLATIVE FRAMEWORK This policy (and the supporting procedures) has been produced with reference to the following documents: Communities Scotland Performance Standards AS5.2 Factoring Ochil View Corporate Objectives nos 1 and 2 The Scottish Executive s Good Practice in Housing Management Factoring The Guide to the Abolition of Feudal Tenure (Scotland) Act 2000 The Title Conditions (Scotland) Act 2004 The Tenements (Scotland) Act 2004 The Tenements (Scotland) Act 2004 (Prescribed Risks) Order SERVICE PROVISON The Association s Factoring Service aims to provide a good quality, self-funded living environment for home owners. The Association aims to provide a service where it is in our interest and in the interest of our tenants to do so and where owners positively affirm their interest in the Association providing a factoring service to them. 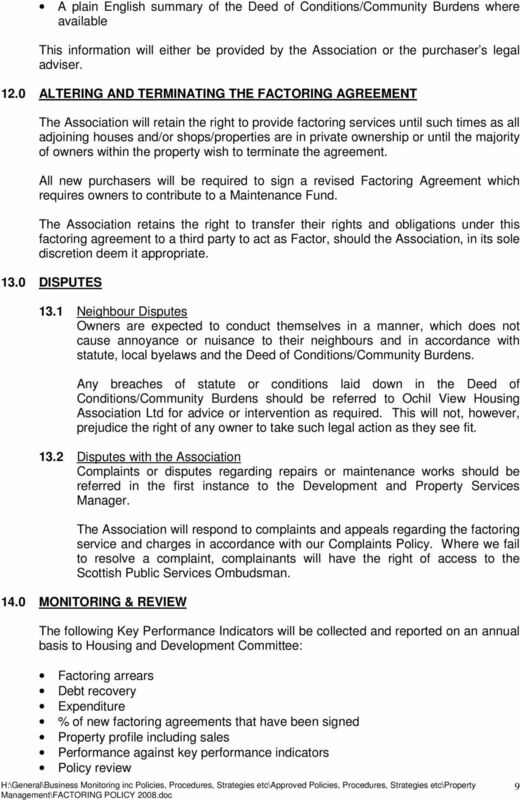 The Association notes the advice of the Land Tribunal that owners cannot be compelled to co-operate with improvements. 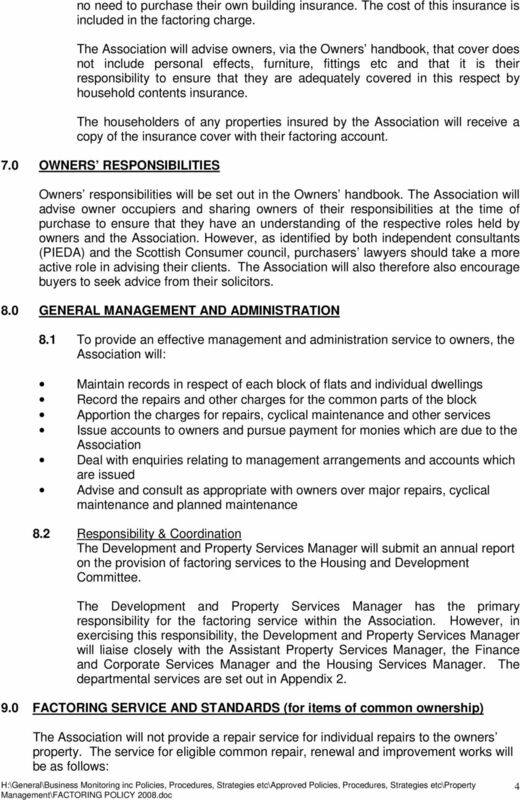 5.1 Scope The Association reserves an option to provide a Factoring Service to the following owners : tenants who have exercised their right to buy their home from OVHA those who previously exercised the right to buy their home from Scottish Homes sharing owners owners who have purchased dwellings outright from OVHA (ie former sharing owners or properties developed for outright sale, excluding Homestake). 1. INTRODUCTION Housing Association Limited Cernach Housing Association as a landlord and factor accepts the responsibility for providing a range of services for all of the properties under its control. This document will be made available in different languages and formats on request, including Braille and audio formats. 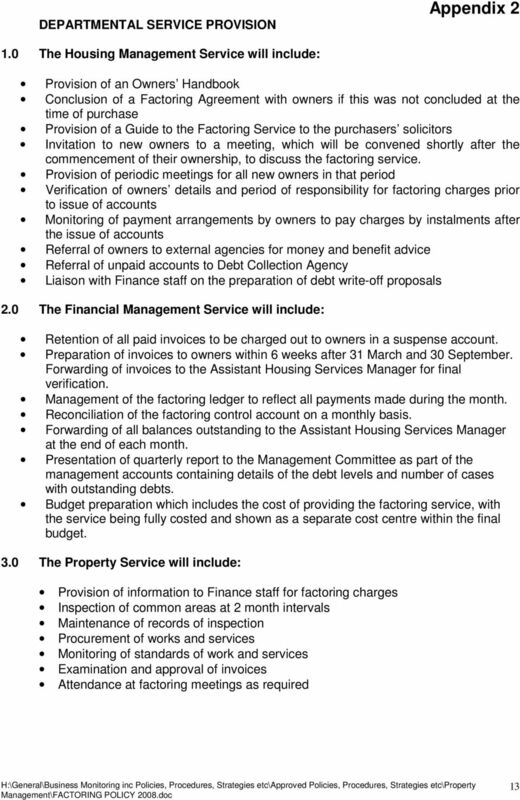 Property Management (Factoring) Policy. 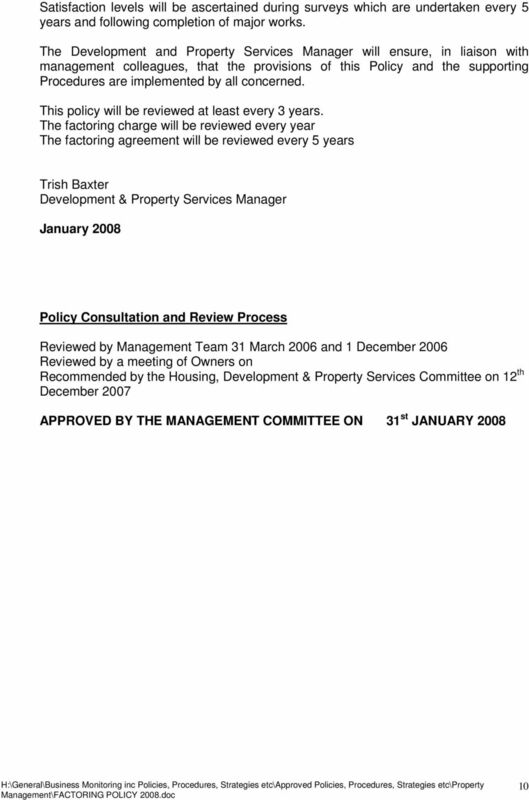 Approval date July 2014 Review date July 2017 Approved by Link Group Board. www.linkhousing.org. Leaseholders your lease Customer focused, quality driven Introduction In this booklet, we aim to give a broad overview and offer general information to all our Leaseholders about how your lease operates. Draft Management Agreement. Between. Michael Laurie Magar Limited (Managing Agent) and. XYZ Limited (the Client / the Owner) for the. 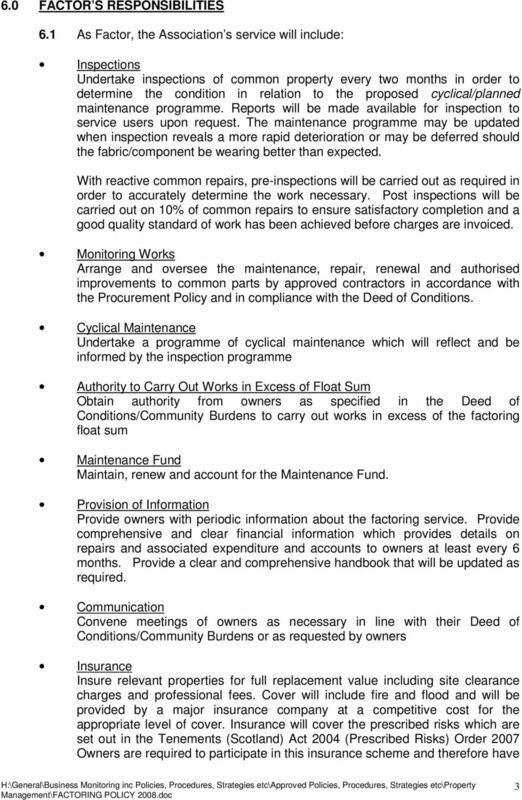 Your statement of Factoring Services River Clyde Homes homefact team, makes every effort to be an excellent factor for your building and this written statement is central to advising you of what that means. 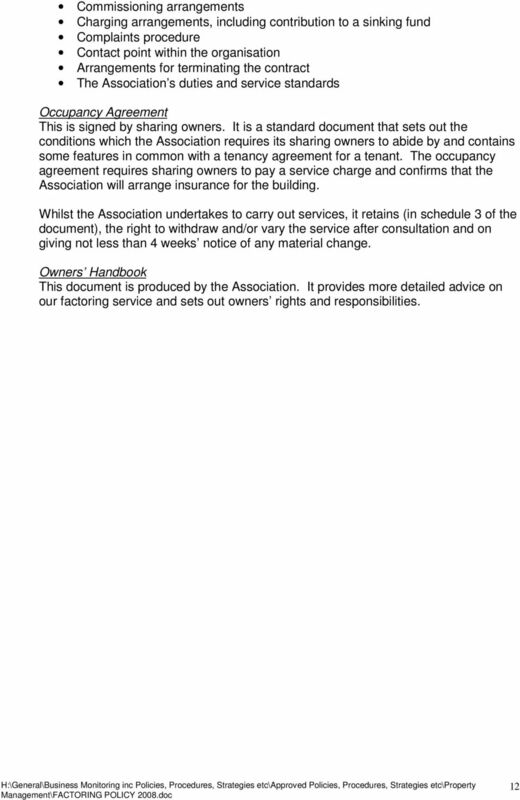 Nick Sanderson, Head of Housing and Property. 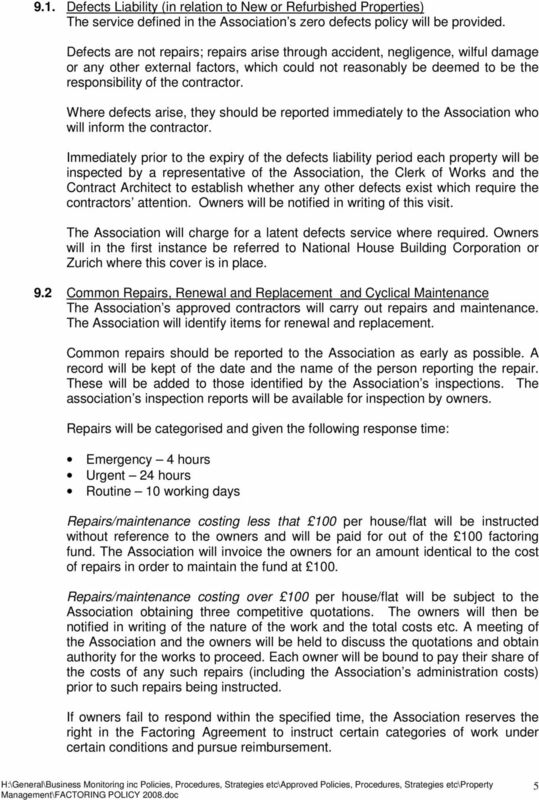 Reason for Report: To advise members of the new Compensation Policy. 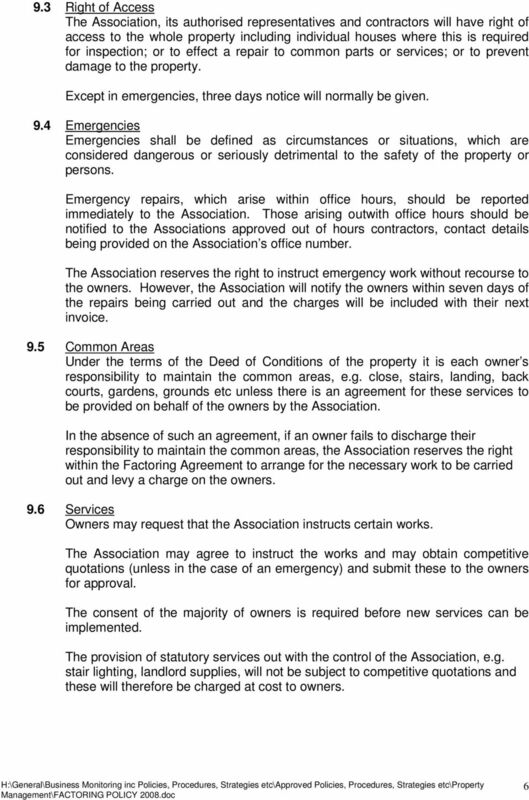 Factored properties include Owners and Sharing Owners who receive services from the Association. Specific questions relative to your home can be addressed with any of the staff members noted in the table shown later. 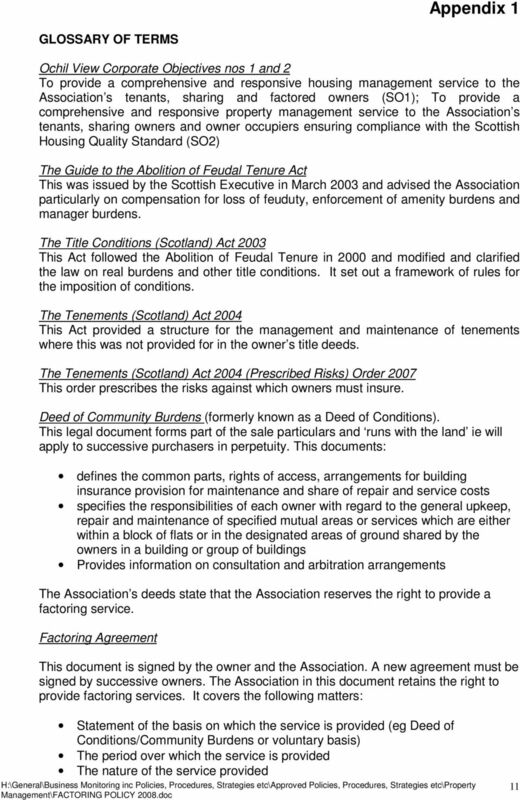 Scottish Homeowners Property Factors Toolkit Govan Law Centre, Glasgow, 2013. 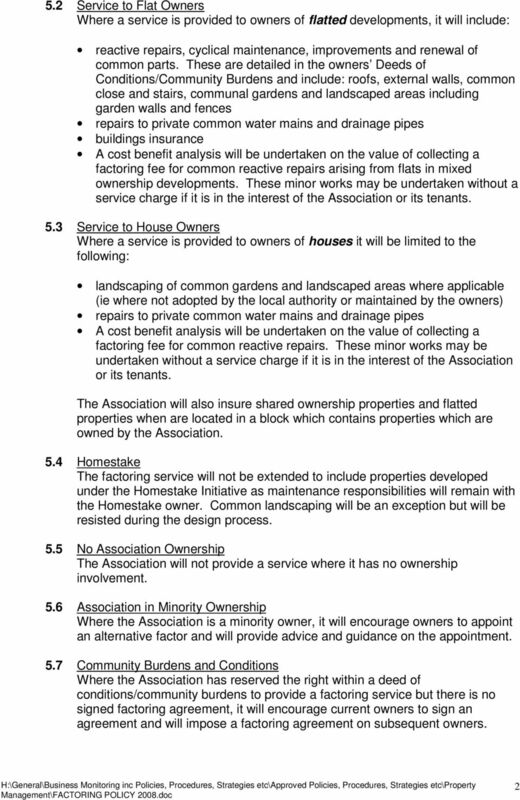 1 Scottish Homeowners Property Factors Toolkit Are you unhappy with the service you are getting from your factor in Scotland?